You are going to Watch Naruto Shippuden Episode 69 English dubbed online free episodes with HQ / high quality. Stream Anime Naruto Shippuden Episode 69 English version Despair.Furido releases Sora’s seal, and tells him the truth: Sora is a pseudo-Jinchuriki. The chakra that had leaked from the Nine-Tailed Fox when it attacked Konoha 15 and a half years ago was harvested and implanted into Sora. 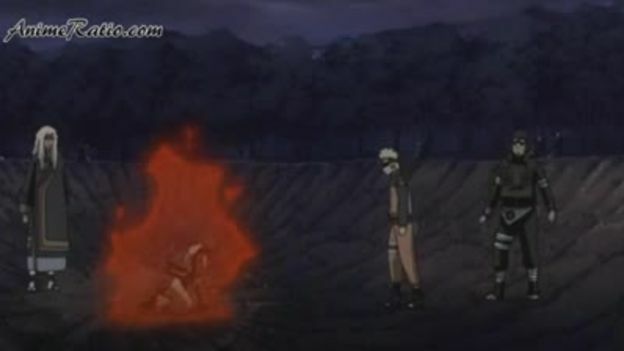 Just then, Asuma arrives at the scene with Naruto. Asuma recognizes Furido and it is revealed that he is Kazuma, Sora’s father. Yamato, Sakura, Kiba, Lee, Ino, Choji and Shikamaru also turn up. Enraged, Sora wants to destroy everything, and turns into the Three-Tailed form of the demon fox. However, Yamato is unable to restrain him, because he does not have the First Hokage’s necklace on him.